PBA bowlers are at Bayside Bowl for a professional tournament this week. Jackson Forrest carefully lined up his bowling ball – with Professional Bowlers Association pros looking on – and sent what looked like a perfect strike down Lane No. 1 at Bayside Bowl in Portland on Sunday. 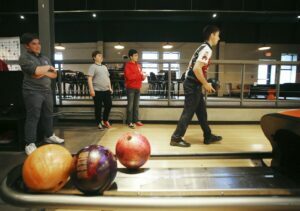 All but one pin toppled, but the Lincoln Middle School seventh-grader still got high-fives and fist bumps from his friends and pro bowlers Brad Miller and Kyle Sherman. “Are you kidding me?” Jackson said, laughing, when the final pin failed to fall. Bayside Bowl is hosting the inaugural PBA Playoffs from Monday through Wednesday, which will be televised on FOX Sports’ FS1 and FOX channels. The top 24 bowlers are invited to the playoffs, vying for a $100,000 first-place prize. Bayside Bowl has hosted pro tournaments since 2015. 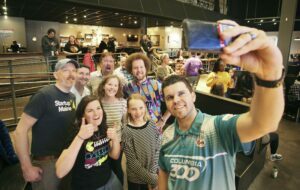 On Sunday, the pro bowlers hung out, bowled and ate pizza with 25 Portland high school and middle school students, some of whom had never bowled before. 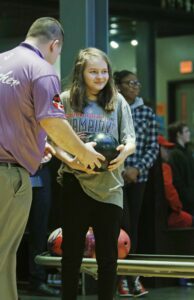 Also on Sunday afternoon, amateur bowlers were paired with pros for a charity bowling tournament that benefited the Full Plates Full Potential nonprofit that works to alleviate child hunger. Jackson, 12, picked up three spares en route to a 100 score, which is about his average. He said he likes to bowl a few times per month with his family during the colder months. “It’s a little bit competitive. 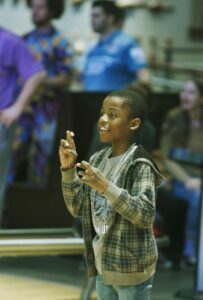 It’s just about bragging rights within the family,” Jackson said, adding that it was lots of fun to play with the pros. 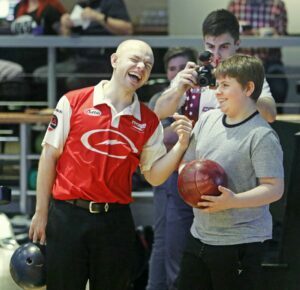 Miller, ranked 19th on the PBA Tour, said he enjoys the camaraderie and relaxation with students and amateurs leading up to a pressure-packed tournament. “We spend so much time competing and grinding on the tour, and it can get frustrating sometimes,” said Miller, wearing a bright red and white bowling shirt with his name in cursive on the back. Miller said bowling can get exasperating because there’s always an element of luck in matches between top players. “You can draw up a game plan and execute it to a ‘T’ and still lose,” he said. But on Sunday, it was all about fun and introducing students to the sport. Gemima Motema, 17, a Portland High School student, said she had never bowled before, but had a great time even though she didn’t get a strike. “It was so much fun to play with the pros,” Motema said. Davina Kabantu, 18, also of Portland High, said she plays occasionally. She got one strike and two spares, but was awed by how skillful the pros were. “It’s crazy to be near them and just see how good they are,” Kabantu said. 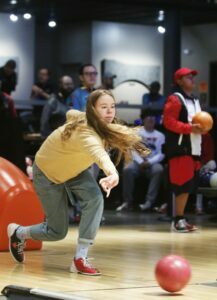 Justin Alfond, co-owner of Bayside Bowl, said bowling is making a comeback, and the PBA event will feature lots of turkeys – three strikes in a row – and maybe even a 300, a perfect game of all strikes.